Click the button below to add the Tire Sock Fabric Snow Chain Kit to your wish list. 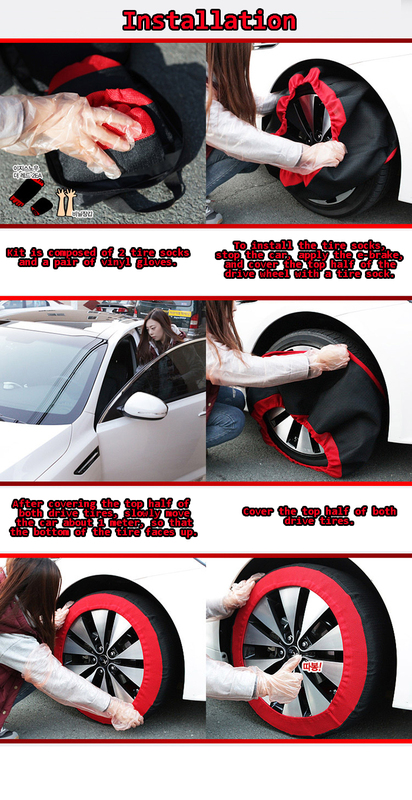 Fabric tire sock set, provides traction to tires in snow or ice, preventing your car from getting stranded. Tire sock kit made in Korea. Each kit is composed of 2 tire socks, one for each of the drive wheels, as well as a set of long vinyl gloves. High quality heavy-duty fabric can be washed and is reuseable, and will provide years of service with proper use and care. Made only with fabric, which will not damage or mar tires or wheels. Easy to install, taking only minutes, with no tools required. Washable and reuseable with proper use and care. Should only be used on snow or ice. Should not be used on tarmac or asphalt. Vehicle should be driven at a maximum speed of 30 MPH or 50 KPH. There are 10 different sizes of the tire sock available, depending on your tire size. Please look to see what size tire you have on you drive wheel by lookin at the chart below. For most Korean cars, it will be front wheel drive. For a few cars such as Genesis and Genesis Coupe, it is rear wheel drive. Price includes shipping and handling charges to anywhere in North America, Asia and Europe. For other regions, please email us for a shipping quote. New Shark Racing website online!